Today in Masonic History we discuss Freemasonry on Film. Freemasonry has appeared both accurately and fictitiously in film since the early days of the genre. Freemasons have played their part in the development of the Movie industry. People like Louis B. Mayer and the Warner Brothers helped to establish the industry. Or actors such as Clark Gable and John Wayne who worked in front of the cameras delighting fans all over the world. Freemasonry as an organization, depending on the film, has been treated harshly, fairly, accurately and inaccurately. Much of this is made easier by the perceived nature of our "secret society". In fact it is such a secret society that every day more and more websites like this one are popping up all across the Internet to inform members and non-members about the inner workings of our organization. There are far too many movies for me to list that mention Freemasonry or cast us as the heroes or villains. Instead I am going to tell you about three of my personal favorites. Let's start with the easy one, National Treasure which was released in 2004. The movie actually played on the connection made by Andrew Michael Ramsay when he made a veiled connection between the Knights Templar and Freemasonry. In the film, Freemasons receive from the Knights Templar, after they are arrested by the King France (a real event), the treasure that the Knights Templar are thought to have uncovered on the temple mount when they had control of Jerusalem (a partially real event). The treasure is hidden on American soil and the founding fathers, some of whom were mason (not as many as Freemasons like to believe), left clues on the Declaration of Independence and other prominent landmarks associated with the founding of the country. Like most films involving Freemasonry it has it's parts where a mason will say "yeah, kind of." Still if you are looking for a fun movie for a lodge movie night, it is a good way to go. The next film is the movie From Hell. The story follows the detective who is assigned the Jack the Ripper case in 19th century London. As he pursues the killer he discovers that there is a conspiracy going on and Freemasonry is at the center of the conspiracy. In the film, the main character has to deal with the Commissioner of Police Sir Charles Warren a real individual and mason who was the first Worshipful Master of Quatuor Coronati Lodge. As the movie progresses on the involvement of the Freemasons becomes more and more apparent and includes a scene toward the end which is now infamous in Masonic lore. It is the moment when writing is found on the wall where, allegedly, Jack the Ripper has inscribed that it is all the "Jues" fault. Some have connected the word "Jues" to the three villains in Masonic ritual. The moment in the film is historically accurate as it is Charles Warren who actually orders the writing to be removed from the wall. The real Warren would later indicate that he did it because, despite the misspelling of the word Jews, that there may be some who would go after Jewish members of the community. This is another good movie for a masonic movie night. A warning it is rather graphic when it comes to many scenes. The final film is, in my opinion, the best film for any Freemason to see. 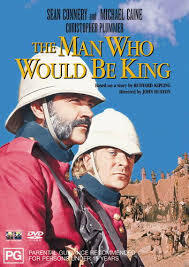 The Man Who Would Be King is based on the short story (you can read it here) by Rudyard Kipling. In the movie Kipling encounters a man who steals his pocket watch and quickly returns it to Kipling when he realizes that he has stolen from a brother mason. The story follows the man who Kipling encounters and his friend as they make their way into a country bordering on India and try to make their fortune. Along the way a series of misunderstandings and the discovery of a city that was founded by Alexander the Great, who in the film is claimed to be a mason, the two men rise to power only to have their deceptions revealed and punished. There is probably no other film out there that has such a strong masonic overtone. Not to mention the movie is fun with many funny parts between the two stars Michael Caine and Sean Connery (to my knowledge neither are masons). For those who click through to read the full article, I invite you to respond to the post on social media and let us know your favorite Masonic themed movie.